If you don't catch Cloud Dance Festival's fruity mixed bill of new, contemporary dance this weekend at the Cochrane Theatre you might regret it. Stalwart festival stars Slanjavah Dance bring a new piece, Crazy Joanna for its London debut, Pair Dance reprise and extend Rush, Taciturn present a triple bill, and Jarkko Lehmus guest stars - he formerly of Scottish Ballet. 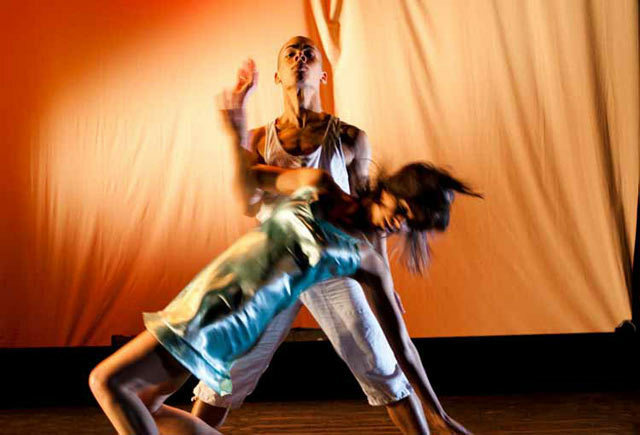 Sillander & Pascual, SuperB Dance Theatre, Sol Dans and Kinisi Dance Company have return slots having appeared in Trouble and Desire and quality newbies take to the stage in the shape of Anima Dance Company, Antique Dances, Joss Arnott Dance, Mary Sherwin (of Kinisi Dance Company), The Typewriters and Cambridge Contemporary Dance. Each night has 7 or 8 performances giving you a mezze style sample of cutting edge choreography with rising star performers and companies. Sadly, this eleventh Could Dance Festival may be the last for a while as the project has been a victim of its own success. Funded entirely by ticket sales it has grown magnificently, fulfilling its brief to present quality new dance and make it accessible, but if it's to carry on it needs proper arts investment. And there's the rub - arts funding's being cut yet again. If you can help support this fantastic dance festival, please get in touch. Props and best wishes to the fantastic voluntary team behind Cloud Dance. We salute you and look forward to the show. Hush is at the Cochrane Theatre, Holborn 16-18 July 2010 at 7.30pm. £12.